These are spun aluminum style cup holders that are designed to be sunk in when mounted, providing a flush style mounting Each cup holder features a rigid mounting flange, while the main body is 3" deep These cupholders will accommodate most beverage cans or cups. Outside (Lip) Diameter: 4-1/2" 4" 3-3/4"
Cutout Diameter: 3-5/8" 3-3/8" 3"
These Marine Aluminum Cup Holders will fit cans, cups, or bottles. They are constructed from spun aluminum. The main body is 3". 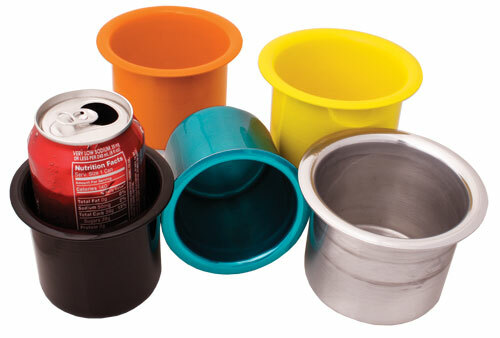 The beverage holders feature a rigid mounting flange. These cup holders are a must in any boat! Outside Diameter: 3-5/8" 3-3/8" 3"